Endoscopic-pathologic Correlation in Patients Undergoing Prophylactic Gastrectomy for Hereditary Diffuse Gastric Cancer (hdgc). 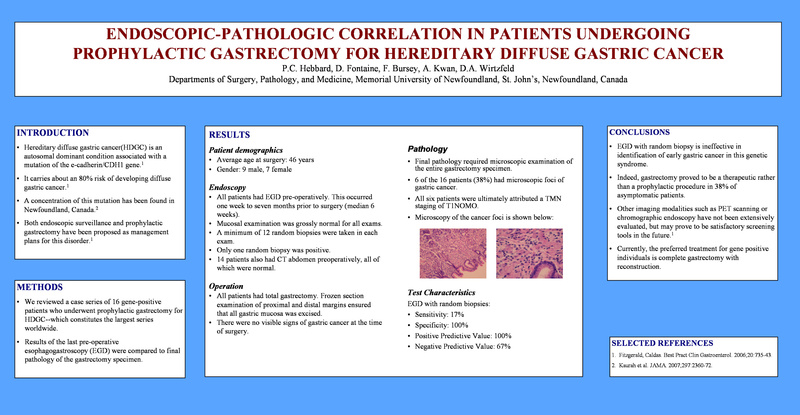 INTRODUCTION: We performed a study of endoscopic-pathologic correlation in patients who have undergone prophylactic gastrectomy for hereditary diffuse gastric cancer (HDGC). HDGC is an autosomal-dominant condition associated with a mutation of the e-cadherin/CDH1 gene and carries about an 80% risk of developing diffuse gastric cancer. METHODS: We reviewed a case series of 16 gene-positive patients who underwent prophylactic gastrectomy for HDGC, which constitutes the largest series worldwide. Results of the last pre-operative EGD were compared to final pathology of the gastrectomy specimen. Pathologic evaluation involved complete examination of the surgical specimen. RESULTS: All patients had EGD one week to seven months prior to surgery (median 6 weeks). Mucosal examination was grossly normal, with biopsies negative for malignancy. Final pathologic examination of the gastrectomy specimens revealed six of the 16 patients (38%) had microscopic foci of gastric cancer. All six patients were ultimately attributed a TMN staging of T1NOMO. CONCLUSIONS: These results demonstrate that basic EGD is ineffective in identification of early gastric cancer in this genetic syndrome. Indeed, gastrectomy proved to be a therapeutic rather than a prophylactic procedure in 38% of asymptomatic patients. The value of PET scanning or chromographic endoscopy has not been extensively evaluated. Currently, the preferred treatment for gene positive individuals is complete gastrectomy with reconstruction.